Browse through the pictures of our fabulous night here. 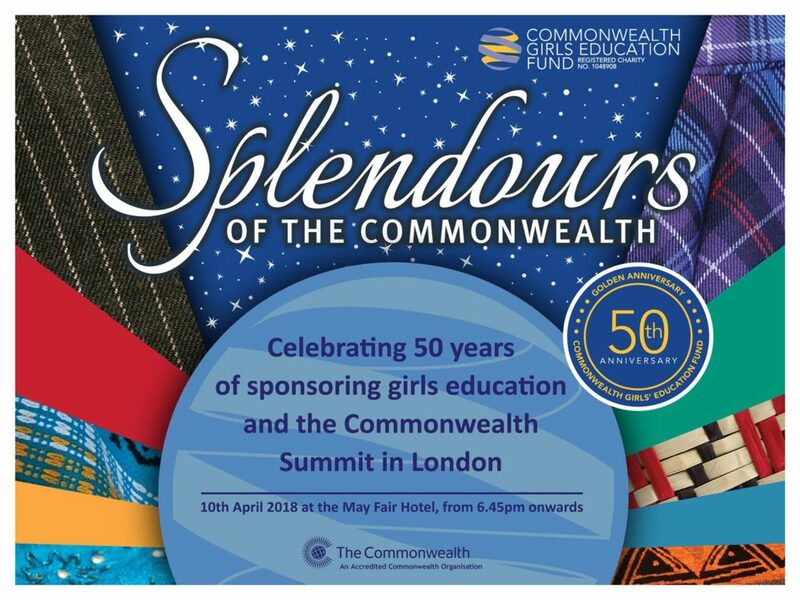 Founded in 1967, the CGEF, formerly known as the Commonwealth Countries League Education Fund, sponsors girls of ability through secondary school where, without financial assistance, they would be unable or unlikely to continue. Almost 3,000 girls living in some of the most disadvantaged and remote places have been sponsored by the CGEF in 40 Commonwealth countries since 1967. The vast majority of our Alumnae are now adults, some are in their ‘60s’! During 2016/17, the CGEF sponsored 355 girls in 32 Commonwealth countries. 146 of these girls graduated during the year with ‘O’ or ‘A’ levels, the rest are making excellent progress in the lower years of secondary school. It costs an average £500 to sponsor a girl for one year and girls are usually sponsored for an average of four years. The Splendours Auction, held to help us raise funds to continue our work, comprises a splendid selection of items. Thank you for your support. Your donation is a fantastic opportunity to show your commitment and passion for such a worthwhile cause that directly impacts the lives of so many girls in so many low and middle economy Commonwealth communities. If you would like to volunteer, support or donate, please contact us directly. We have wonderful stories going back 50 years, demonstrating the great impact these girls can have on their families and communities. Rika from, Pakistan has two brothers and a sister. They were all attending secondary school at the same time, however it was difficult for her father to pay all four fees. They were living hand to mouth. “It was a relief for my father and me when the principal told me that the CGEF was offering sponsorship to students. The school selected my name and I was overjoyed when they awarded sponsorship…I matriculated and went on to gain my Higher Secondary School Certificate. Now I am doing a Doctor of Physical Therapy (DPT) from Riphah International University. There is nothing more important in the developing countries than educating girls. As they say, when you educate the mother, you educate the family, when you educate the man, it is just him! There is no doubt in my mind that a girl with education can bring about change, not just for herself and her family, but in the society itself. If you have enough girls educated in a town or a village, the change starts to occur for everyone. As patron of the CGEF, I would like to send the message to everyone that you could not do something more useful than educating a girl who cannot afford education. Sharon from Samoa comes from a huge family who depend mostly on fishing for income. Her parents struggled to pay her school fees, which left Sharon at risk of being removed from school. She told us:“I desperately request your assistance for financial support so I can complete my studies. I want to become a doctor.” In Tonga, Leila’s parents divorced when she was three, and is now looked after by her grandmother who weaves mats to sell at market, but this is not enough to pay for all Leila’s school materials. The CGEF sponsored Laila’s books and uniform, alleviating some of her financial pressure.